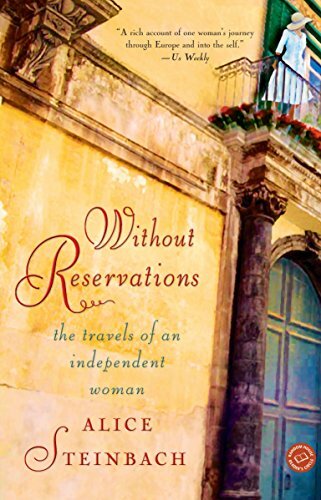 In the tradition of Anne Morrow Lindbergh's Gift from the Sea and Frances Mayes's Under the Tuscan Sun, in Without Reservations we take time off with Pulitzer Prize winner Alice Steinbach as she explores the world and rediscovers what it means to be a woman on her own. "In many ways, I was an independent woman," writes Alice Steinbach, a single working mother, in this captivating book. "For years I'd made my own choices, paid my own bills, shoveled my own snow, and had relationships that allowed for a lot of freedom on both sides." Slowly, however, she saw that she had become quite dependent in another way: "I had fallen into the habit . . . of defining myself in terms of who I was to other people and what they expected of me." Who am I, she wanted to know, away from the things that define me--my family, children, job, friends? Steinbach searches for the answer to this provocative question in some of the most exciting places in the world: Paris, where she finds a soul mate in a Japanese man; Oxford, where she takes a course on the English village; Milan, where she befriends a young woman about to be married. Beautifully illustrated with postcards Steinbach wrote home to herself to preserve her spontaneous impressions, this revealing and witty book will transport readers instantly into a fascinating inner and outer journey, an unforgettable voyage of discovery. Sending to Bonnie in Minnesota 1.6.05 Enjoy! This book has been on my wishlist for a while, so glad Erica traded with me. It looks like a great read...yet another book I will look forward to reading! After I'm done, I'll repost it there and send it on it's way! Received this from PaperBackSwap a few years ago. Haven't read it yet and I'm trying to reduce my book collection before I move, so it's time to pass it along to someone else.